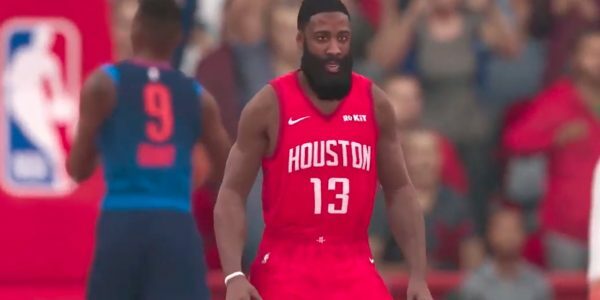 When it comes to the NBA Live 19 player ratings, the Houston Rockets’ James Harden is among the best overall. There are players rated above him as obvious choices, but they are just a few in number. However, the 2018 game’s cover athlete has been on a scoring spree lately and keeping the Rockets relevant in the Western Conference. He recently spoke to NBA Live 19 about his impressive game this recent season and what he’s done to keep improving. Harden was replaced on the NBA Live 19 cover by the Sixers’ Joel Embiid, but the 2018 cover star is still balling beyond what many fans imagined. In EA’s NBA Live basketball world, he came into the new game with a mid-90s player rating. He was also tied in terms of ratings with fellow NBA All-Star players Anthony Davis and Stephen Curry. However, the Rockets’ Harden been in the majority of headlines in terms of stats lately, based on his excellence of execution in scoring. Impressive performances on the real hardwood also lead to EA’s NBA Live game giving Harden rating upgrades as needed. They also reached out to the video game star in real life to get his thoughts on how he’s improved his performance. “Nobody can take me out. I'm zoned in right now.” @JHarden13 tells us why he's more locked in than ever. Right now, he’s leading the league with 36.6 points per game and also gets 6.7 rebounds along with 7.8 assists a contest. Harden has achieved 40 points or more in three of his last five games. He’s also scored 30-plus in 29-straight games which is an absurd pace but puts him amongst some of the elite players of all-time. Harden ranked at the top amongst all shooting guards, with Golden State’s Klay Thompson behind by three points. He’s also tied with the top point guard, Klay’s teammate Stephen Curry, and big many Anthony Davis, as each achieved a 94 rating in NBA Live 19. The only players above them are fellow Western Conference superstars LeBron and KD. Harden has been racking up plenty of impressive performances and moments this season. He likely continues to be a driving force as long as he remains healthy. In Saturday night’s showdown versus Oklahoma City, Harden dropped 42 points in a losing effort. Rewind back to just last month and Harden achieved a sick 61 points, 15 rebound game against the Knicks. Go back to Jan. 11 for evidence of his ability to achieve 40-point triple doubles. The only thing that can really stop him at this point is an injury. As of Monday (Feb. 11), he is listed as “Day to Day” with a shoulder injury from Saturday night. Still, the Rockets seem to be soaring with James Harden providing the fuel and should be a force come this NBA postseason. Expect NBA Live ratings to continue to reward his performances. Check out the full James Harden video above, or text interview at EA.com here. See more of our news, information, and how-to help for the game at our NBA Live page.